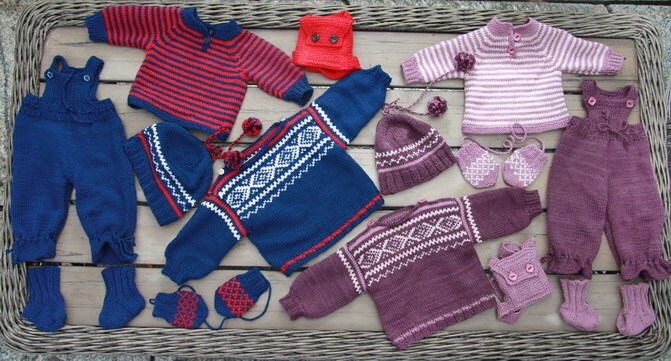 From my second book, Strikk Dukkeklær (Knit Doll Clothes). 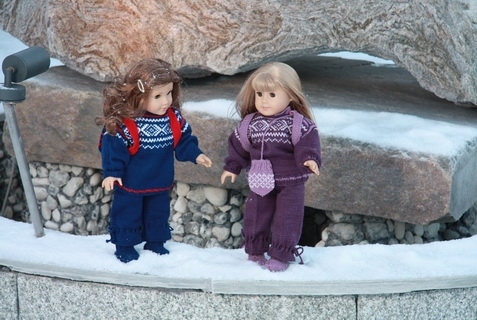 This time I have knitted “The Norwegian Marius sweater”. 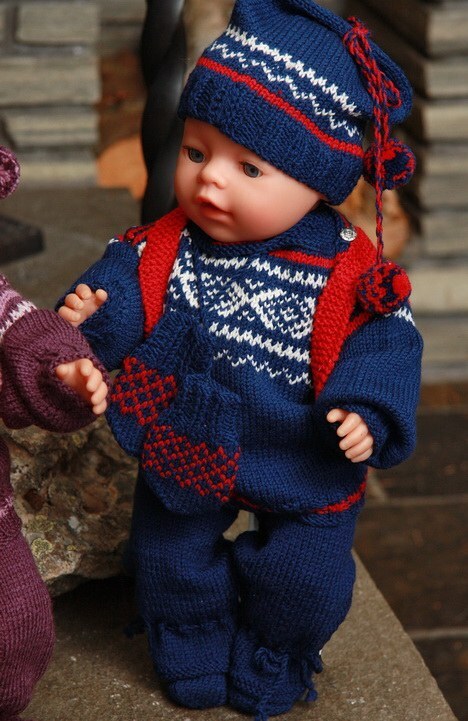 This sweater was designed by Unn Søiland Dale in the year 1953. 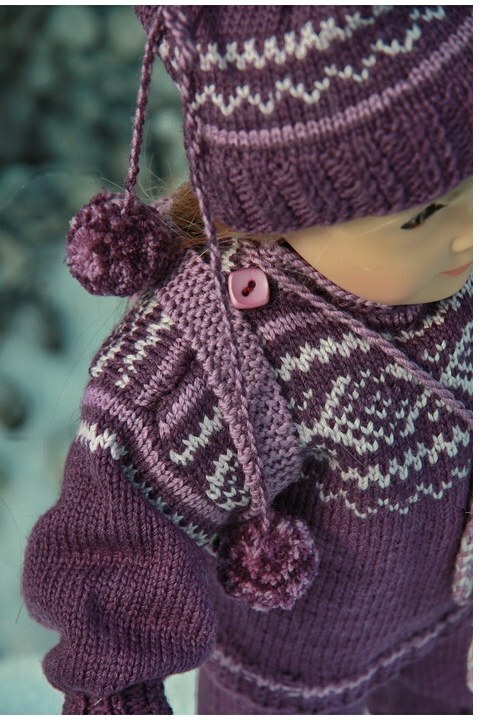 The year after Sandnes Ullvarefabrikk (woolen mill) bought the pattern from her. 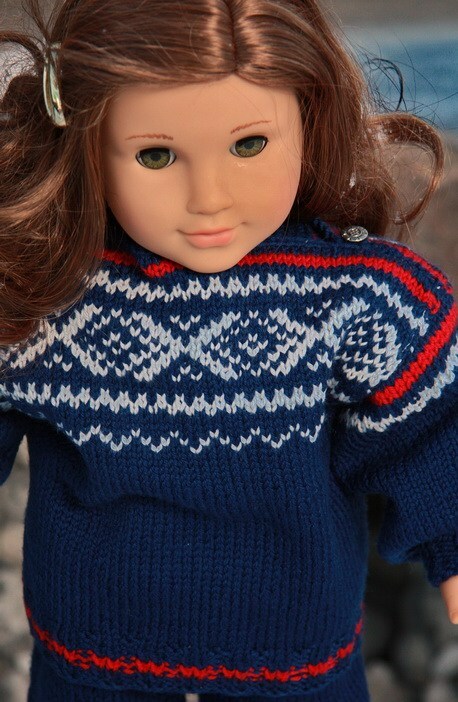 They say this sweater is the most sold and hand knitted sweater in the world. 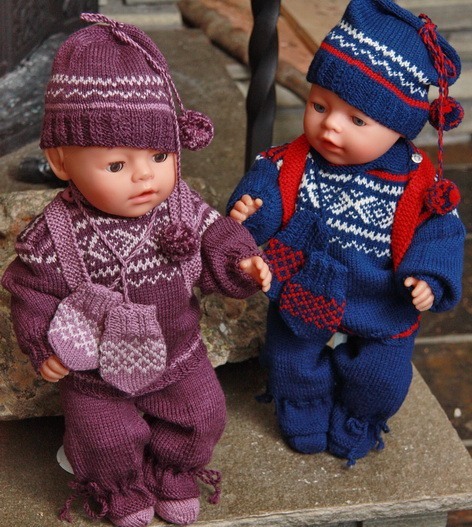 Sweaters were usually knitted in thick wool and natural colors; this sweater was knitted in colored yarn. 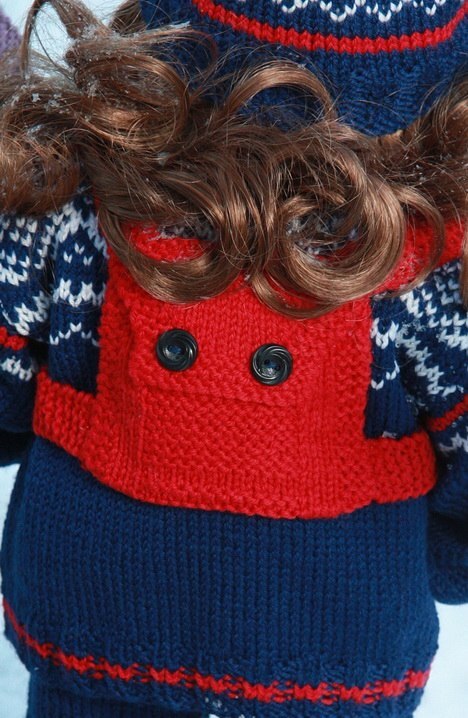 The sweater was really something new! 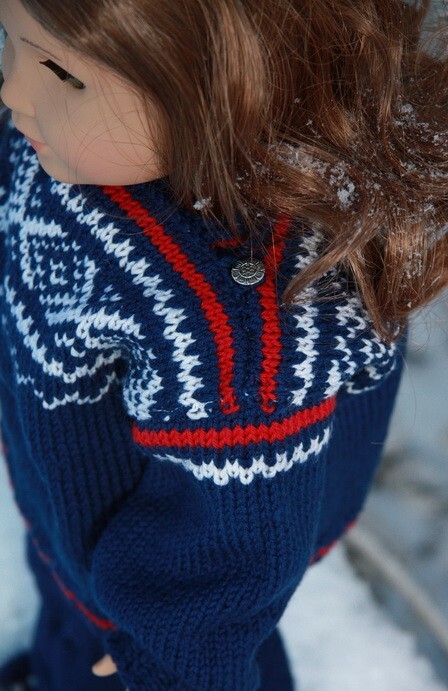 The designer used the colors from the Norwegian flag and very soon the sweater was enormously popular. Kids and grown up people! 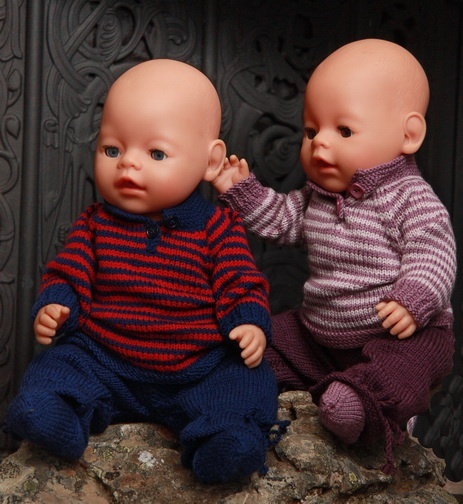 All had Marius sweater. 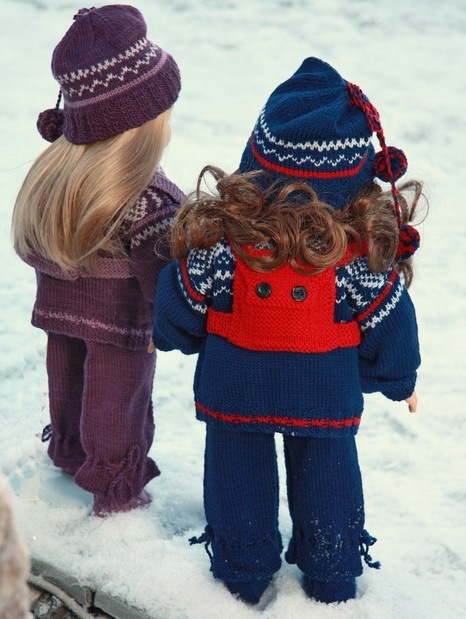 The sweater got the name “Marius “after a very clever ski runner at that time! 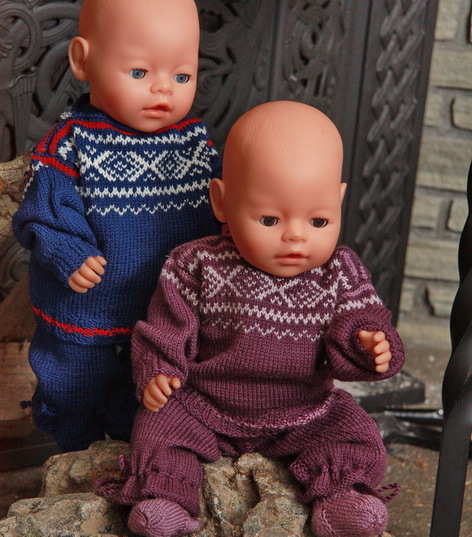 I have 3 kids and all of them had Marius sweater when they were school kids. 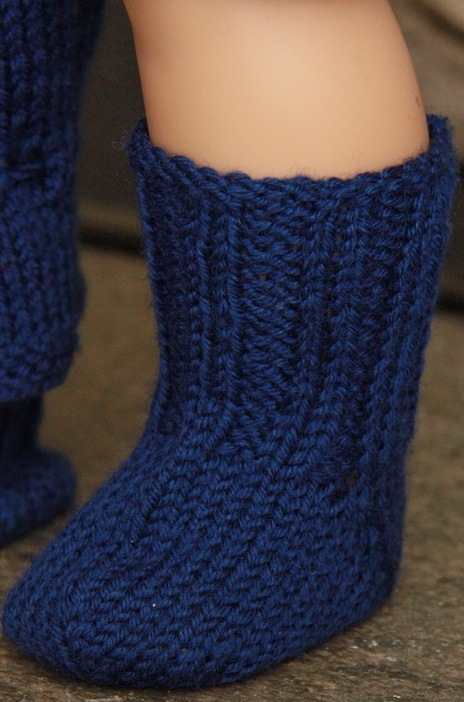 Today the Marius pattern is used in so many ways. 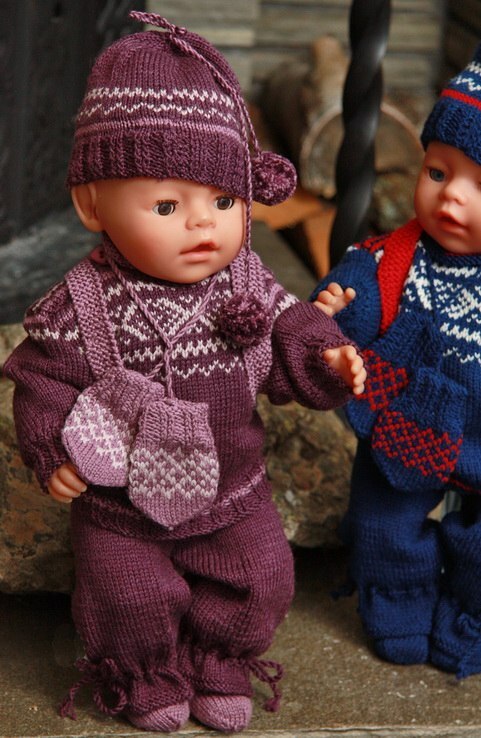 They knit hairbands, skirts, baby clothes/suits, and much more. It may be the” The Norwegian Husflid” who sells mugs and candles and much more where knitted Marius patterns are used round it. 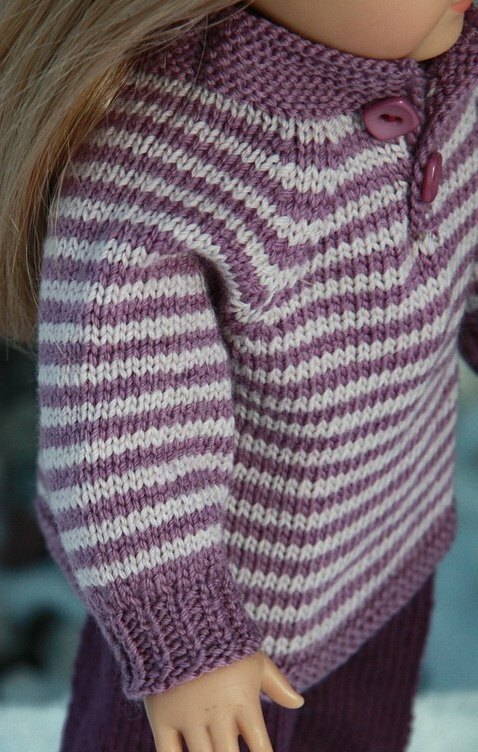 I knitted this Marius sweater for my second book, Strikk Dukkeklær (Knit Doll Clothes), published in 2002. 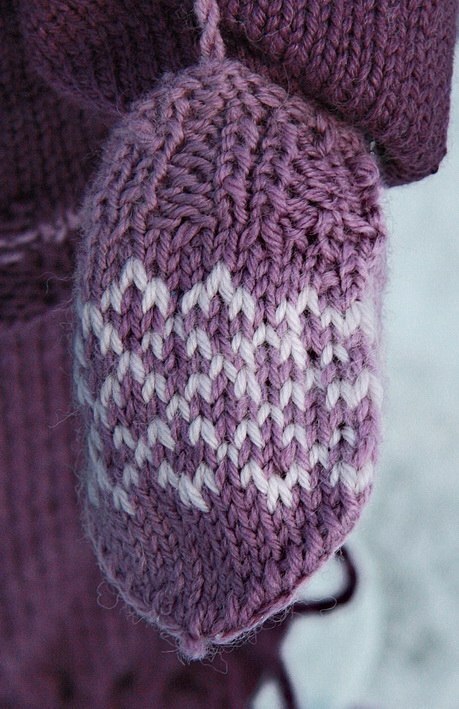 Between the yarns I had at home earlier this summer I found different colors in lilac. 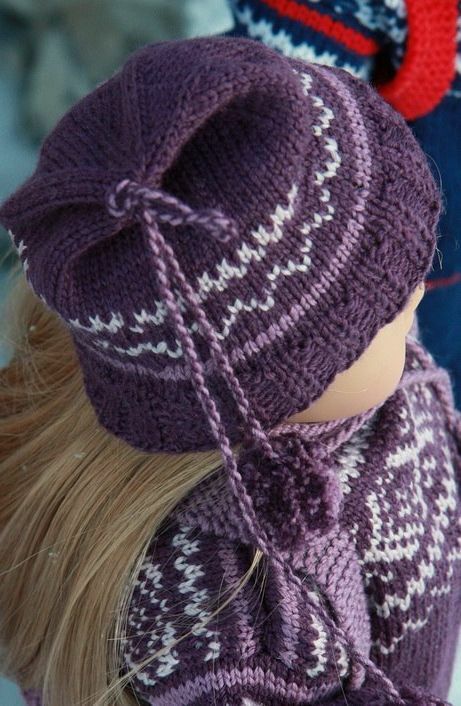 As my daughter is very clever to mix colors I asked her what to knit. 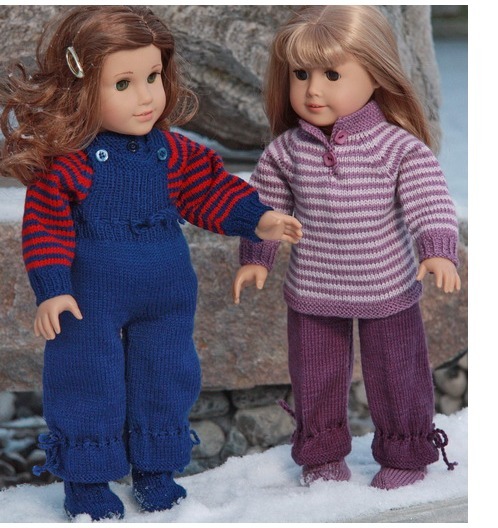 Then she suggested the Marius sweater. 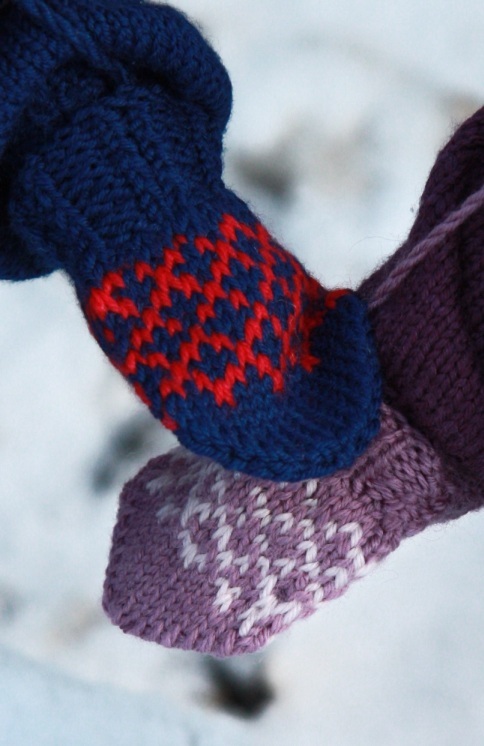 In my thoughts I have always meant that the colors should be red, blue and white. 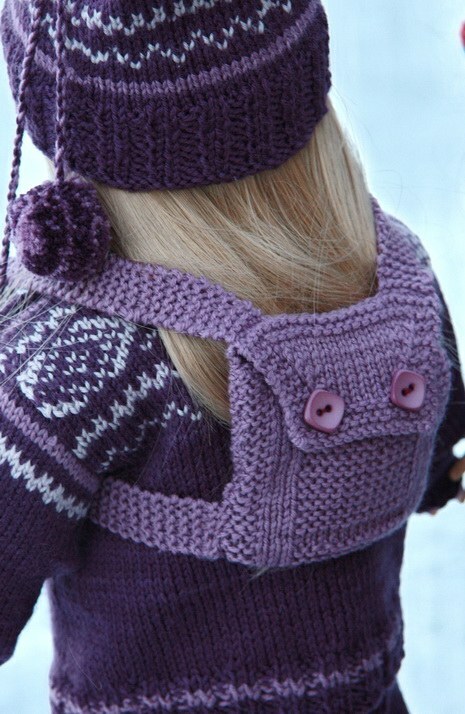 Still, I was thinking about this for a while, and one day I found the pattern from my book and started to knit it in lilac colors. 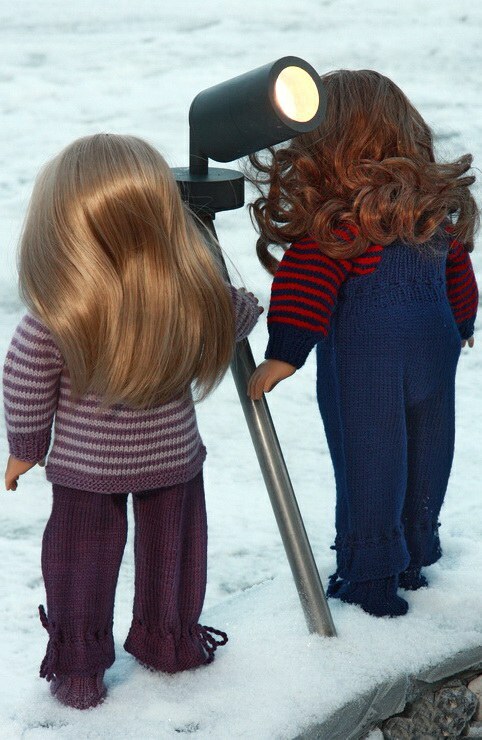 Very soon I saw that this was an exciting combination and that I liked these clothes in the new colors a lot. 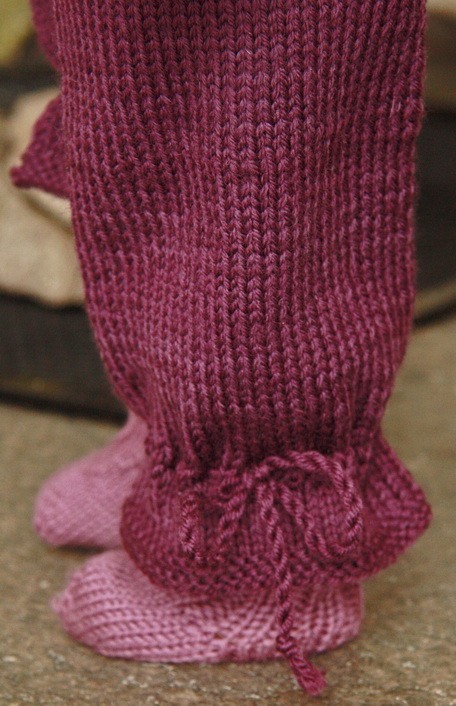 Her you can see the result when Marius is knitted in 3 lilac colors. I am very satisfied myself and hope you to like it. 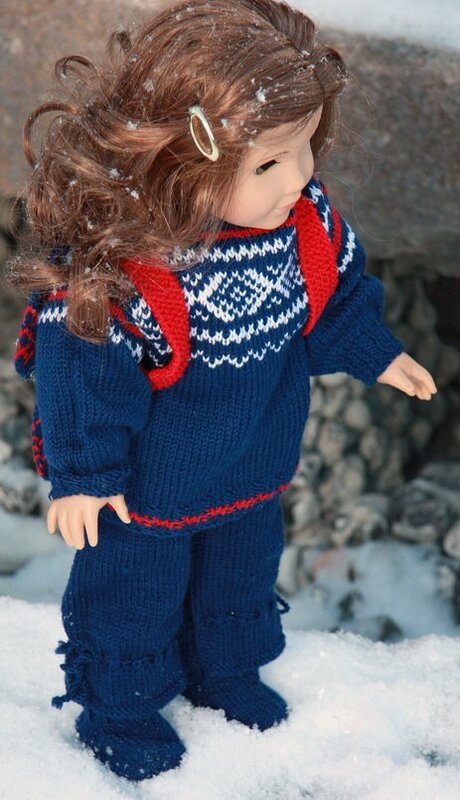 You will also find the sweater from the book in red, blue and white if you should like that better. 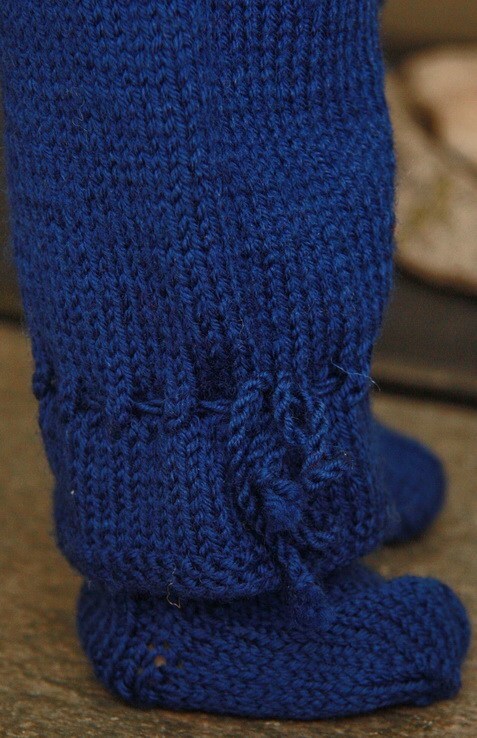 Good luck with your knitting! I hope you enjoy!